Hyperbolic Nutrition is a superfood/supplement company designing foods to help you achieve your nutritional and healthy lifestyle goals. Our energy is focused on making a handful of food products, which help you feel great and live healthily. Our core product reflects this. 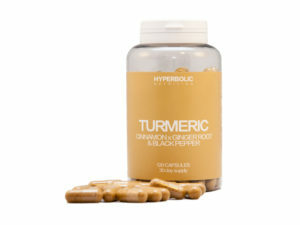 Our Turmeric complex capsules are designed to help promote good skin and hair health, help you manage weight and help you feel good, enabling you to live healthy and happy. We want to remove the confusion and cut through the many supplements that crop up. Instead, our aim is to provide a streamlined range of products with clear benefits, that don’t get in the way of one another. • Promotes healthy skin – Natural anti-oxidants help eliminate cell-damaging free radicals, and the anti-inflammatory properties of the elixir help sooth external skin conditions such as eczema. Glow gold like the root itself! Reviews should include images you’ve taken of the product and a link to the product page and Hyperbolic home page. Can look to put on a blogger-specific voucher code and set up an affiliate/commission per referred sale.